Command and Conquer, the iconic PC RTS that popularised one of the most influential genres of the ’90s, is now a mobile game named Command & Conquer Rivals. Unveiled at EA’s E3 conference, the Global Defence Initiative and the Brotherhood of Nod will once again face off, but across a tiny, hex-based grid. Each side has a base, and will vie for control of a missile in the centre of the map. Possessing a majority of control grids will capture the missile for your side, and begin charging a meter. Keep hold of the missile until the meter fills to launch a missile at the enemy base. Two missiles will take out a base and win the match for your team. 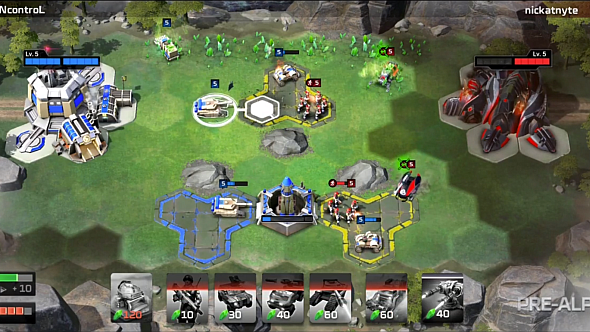 Command & Conquer: Rivals will come to iOS and Android devices, and if you’re on Android, you can download it today.